This class will cover use cases of the Bayesian methods in the medical domain. First part of the class is based on article: “Local computations with probabilities on graphical structures and their application to expert systems” by Lauritzen, Steffen L. and David J. Spiegelhalter. Second part is inspired by “An intercausal cancellation model for bayesian-network engineering. International Journal of Approximate Reasoning” by S.P. Woudenberg, L. C. van der Gaag, and C. M. Rademaker. In this section we will follow a simplified use case of the medical diagnosis, as defined in the following quote from the article. First task of the “knowledge engineer” is to find a structure of Bayesian network which fits the story. There exist automatic tools to learn the structure from examples, but in this case the structure should be clear enough to create the network by hand. Draw (on paper?) a Bayesian network describing the story from the previous section. The problem with Bayesian model you've just created is that it doesn't provide with any useful info. Mostly because of the arbitrary prior probabilities, you've used. Reality is rather harsh, often you don't have access to any realistic priors (one of the arguments of critics of Bayesian methods). In this section we will try to make up for that and find make the network useful. The simplest way to have realistic priors is to not have any priors at all :) In other words — we assume, we know nothing about probabilities. In Problog you can state this fact by using t(_) predicate, e.g. Says you do not know nothing about probability of patient being smoker. or in on-line editor by simply choosing Learning from the list. The learning should result in new model with new probabilities. If you receive an “Inconsistent Evidence” error, it means that your model is not compatible. Sometimes the simplest way to solve this problem is to include leak probabilities in the model. Leak probabilities are probabilities stating that some random variable can be assigned to a value without any particular reason, e.g. here we state that variable var can't be true because of an external reason. Command line tool can do it automatically (check prolog lfi –help). can you think of possible difficulties of this approach? what are the learned probabilites? 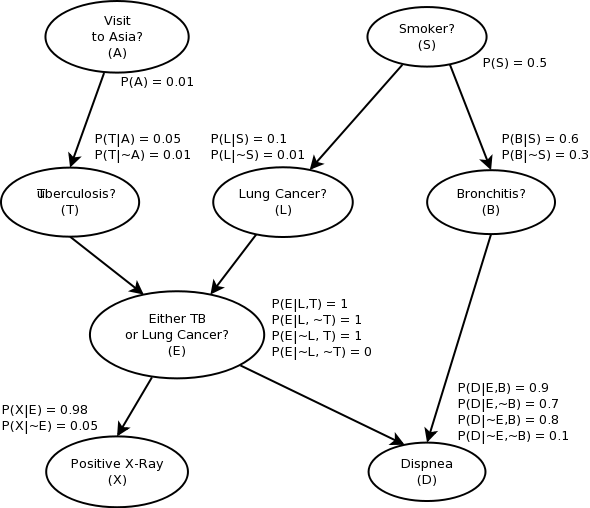 what is the probability of a smoker with positive x-ray to have a lung cancer? do you see any problem with the learned model? Doctor has to treat patients with primary type-1 osteoporosis. Two common treatments for osteoporosis are calcium supplementation and medication with bisphosphonates. The bisphosphonates are much more effective than calcium, but the concurrent intake of both medications will fully cancel out the effect of the bisphosphonates and the effect of the calcium supplementation is cancelled out partially. what is the chance of successful treatment when we use both calcium and bisphosphonates?